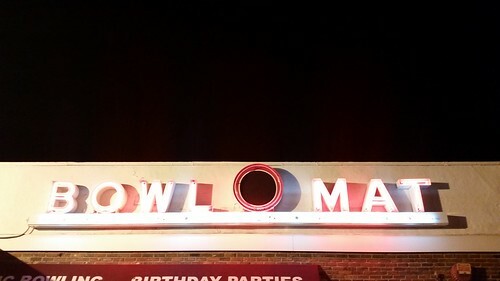 The sign at the Beverly Bowl-O-Mat. I walk by this sign pretty often. I appreciate its oldness. It speaks to a sign of the 1970s or 1980s. Enough neon to tell you that it's from a certain time and place where this would have been a call for the hip. Now, it speaks to a sense of past, a sense of artifact. The entirely black sky behind the sign does seem a bit scary though that is more having to do with being in a city, than it does imply that the stars have all but disappeared.